Watch how these three year olds integrate language, play, body cues, facial expression, emotion and reciprocity in their interactions with me. In Narrative Play Therapy, the child and the therapist work together in a play context, either in a quiet office setting or in the outside environment. The goal is to form a trusting relationship with the child. There are four phases to Narrative Play Therapy. Each goal and objective can be modified and measured in a different way, depending on the child. For instance, the period of time varies with each child; some children take months to accomplish the goals in phase one and others take a few weeks; some may need extensive prompting and a long time to relate and some may need no prompting and very little time to accomplish an objective. 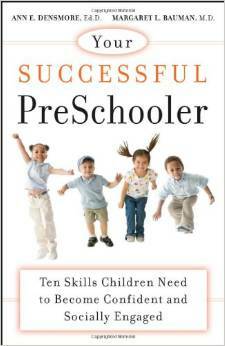 Each objective must be written to address the needs of each individual child. Some objectives may be broken down into small components. The following examples are only a guide and not a specific template to insert into a child’s IEP. The play sessions referred to in these goals are 50 minutes each. 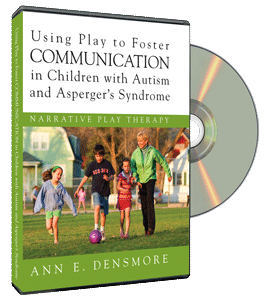 Goal: The child will notice and make contact with the other participant in a Narrative Play therapy session. Reach for the other person’s hand, move closer, or make vocal sounds that show interest in the other person at least three times. Imitate sounds, gestures, or words made by the other person at least three times. Take one or two vocal turns with the other person. Stay in the same physical proximity with another person for at least five minutes. Goal: The child will sustain some joint attention activity with another participant in a Narrative Play therapy session. Sustain eye contact, stay close to the other person, and use language for at least one minute to engage the other person in play. Bring an object to the person or point out something in the environment to watch in order to engage the other participant in play at least twice. Use language, listen to, and take more than two vocal turns with the other person. Use symbolic play and join another person to create a simple story with intentional actions in the same play area for over five minutes. Goal: The child will initiate reciprocal interactions with a participant and express ideas and emotions in a Narrative Play session. Initiate vocal turn taking and eye contact with another person while playing for at least five minutes with that person. Narrate his own play actions, show objects to another person, initiate a plan for a story or play theme with another person, and retell the story sequence. Listen to another child’s ideas and follow another child’s actions for five minutes. Express at least one emotion (e.g., anger, frustration, disappointment, happiness, or excitement) with subtle cues of language (gesture, body language, facial expression, voice tone) that are meaningful to another person in play. 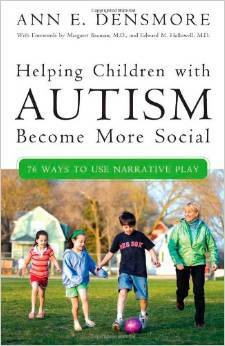 Goal: The child will join others and engage in play using language and narrative. Point, follow, and comment with others on the playground or another outside location such as a baseball diamond or park. Allow others to change the play themes, negotiate a plan for a story, and state the feelings and needs of others at least once. Use language to express ideas and feelings about the events in play or to describe other’s actions and negotiate problems. Stay in the same physical proximity with others and use language to bring them closer or to limit their actions.